The Royal Road Writer-Director-Producer Jenni Olson is one of the world's leading experts on LGBT cinema history and is currently VP of e-commerce at WolfeVideo.com. Her debut feature film, The Joy of Life world premiered at the 2005 Sundance Film Festival and went on to play a pivotal role in renewing debate about the need for a suicide barrier on the Golden Gate Bridge, as well as earning the 2005 Outfest Award for Outstanding Artistic Achievement and the 2005 NewFest Award for Best U.S. Screenplay. Jenni’s most recent short film, 575 Castro St. premiered at Sundance and the Berlin Panorama in 2009. Commissioned for the release of Gus Van Sant’s Milk, the film can still be seen online at the Milk website, on the Sundance YouTube Screening Room page, and in a permanent installation at 575 Castro Street (home of the Human Rights Campaign Action Center & Store). 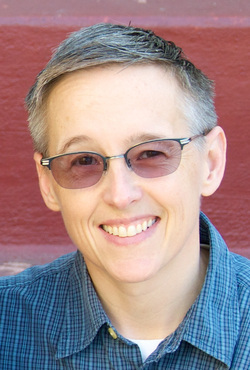 In 1995 Jenni was one of the founders of PlanetOut.com where she established the massive queer film industry resource, PopcornQ and pioneered the first online showcase for LGBT short films (the PlanetOut Online Cinema). More recently she co-founded the first global LGBT streaming movie platform, WolfeOnDemand.com. She is on many advisory boards including the Outfest/UCLA Legacy Project for LGBT Film Preservation, and Canyon Cinema. She is also on the board of the San Francisco Jewish Film Festival and is very proud to be the co-founder of the legendary Queer Brunch at Sundance. She frequently serves as an advisor to filmmakers — most recently serving as executive producer on Chris Mason Johnson's acclaimed gay drama, Test — and is currently an associate producer on Deb Shoval’s new lesbian feature, AWOL (now in post-production). ﻿﻿As a film collector and archivist Jenni’s historical movie trailer programs (including such hits as: Homo Promo and Afro Promo, both now available on DVD) have been shown at film festivals around the world, as have her many short films and videos: Levi's 501s Commercial (1991); Sometimes (1994); Blue Diary (1997); Blow-up (1997, co-directed with Kadet Kuhne); Meep Meep! (2000) and Matzo Maidels (2003, co-directed with Julie Dorf and Monica Nolan). She also produced the fabulous 35mm short, Sing Along San Francisco (2002, directed by George Corzine). In addition to her vast curatorial experience (including stints at the Minneapolis/St. Paul and San Francisco LGBT Film Festivals) Jenni has written extensively about LGBT film since 1985 for publications too numerous to mention. Her wildly entertaining coffee table tome, The Queer Movie Poster Book was a 2005 Lambda Literary Award nominee. Materials from Jenni’s personal archive of rare LGBT film prints have been utilized in dozens of films including such acclaimed documentaries as Stonewall Uprising and I Am Divine. She can be seen in several documentary films offering her perspectives on LGBT cinema history, most recently in the IFC documentary, Fabulous! The Story of Queer Cinema. She is also featured in the documentary, Vito a film portrait of Vito Russo (author of The Celluloid Closet and one of her most significant mentors). Olson continues to write about LGBT film for numerous media outlets including QMovieBlog.com, AfterEllen.com, Queerty and Filmmaker Magazine as well as doing occasional creative writing like this amusing short vignette at Mr. Beller’s Neighborhood. She lives in San Francisco with her wife — international LGBT human rights advocate, Julie Dorf — and their two daughters, Hazel and Sylvie.